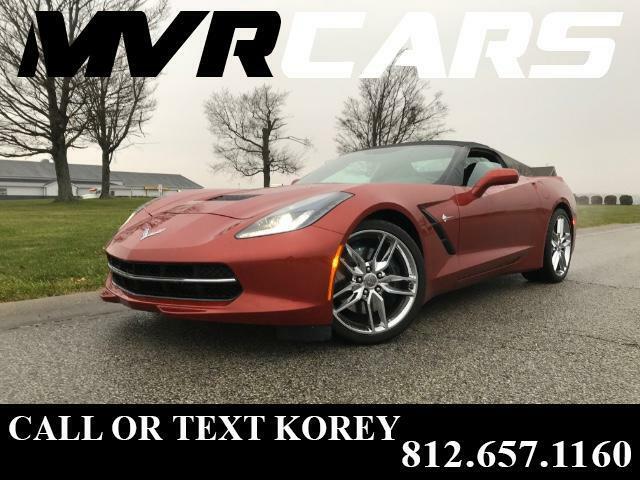 **CALL FOR AVAILABILITY** **Appointment only on this car** 2015 Chevy Corvette Z51 3LT 2d Convertible with ONLY 2,866 miles, 1 owner and 0 accidents, Automatic transmission, 6.2L V8, Orange exterior with a black convertible top in great shape, Black leather/suede seats, Power seats, Navigation, Back up camera, Bose speakers, XM.Bluetooth.USB.AUX.Radio, Remote start, 19in chrome wheels in the front & 20in chromes in the back, Tires in great shape, HUD, Power window, locks, and mirrors, Heated and cooled seats, Track/Tour/Weather/Eco/Sport modes, Power screen, Very nice car like new!! Bank financing available if needed, Please call/text Korey at 812.657.1160. Thank you for looking!